These clients are the original owners of a classic 1960's contemporary home. Their desire was to update their furnishings with pieces that would complement the architecture and their Knoll Bertoia Diamond Chair. A leather sofa, Barcelona chairs, and travertine tables were selected. 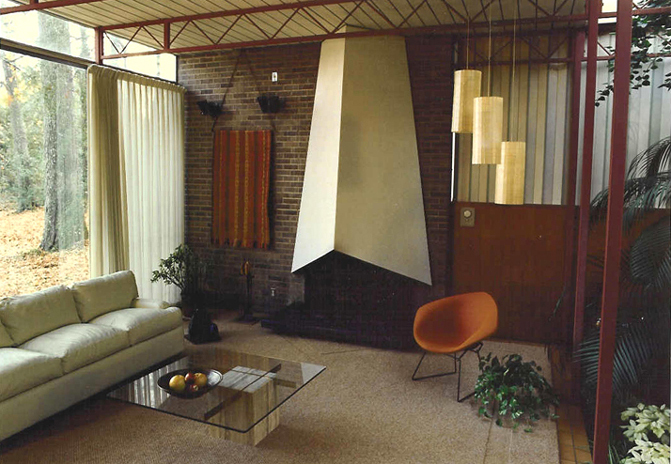 The carved border of the custom wool area rug was designed to follow the lines of the fireplace. Simple casement fabric frames the view.